On a recent sailing excursion, my friend Adam told our crew about The Two Types of Fun. Type I Fun is fun at the time and fun afterwards and there is no misery or discomfort involved. Type II Fun is not at all fun at the time, given the large amount of both misery and discomfort involved, but much later, you recall the experience as “worth it” or “meaningful” or even, dare I say, “fun.” We had an inordinate amount of Type II Fun over the next few days. Wednesday started innocently enough. The Fox Glacier hike is about one hour round trip, not as pretty as Franz Josef and also dying, but we enjoyed the brisk morning walk before it the trail got crowded. When I was originally researching our trip, I read about a backpacking gem entitled Welcome Flat Hut and Natural Hot Pools. Noting the words “flat” and “hot pools,” I figured it would be an easy to moderate hike for an overnight trip. 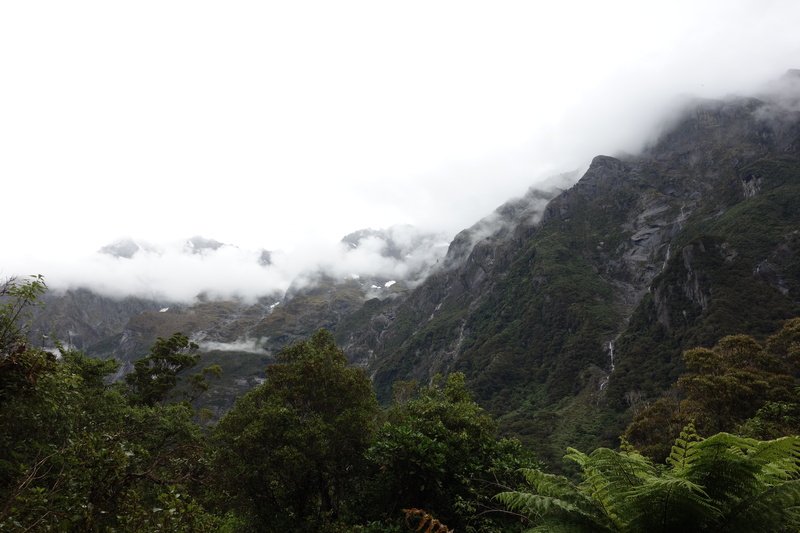 The route along the Copland Track is regarded as one of the most beautiful hiking trails in all of New Zealand. 17 kilometers each way, two days, flat, amazing hot pools, what could possibly go wrong? It all started with a particularly horrible sandfly infestation at the parking lot. As we gathered our gear in the trunk, droves of the nasty critters descended upon us and even more managed to fly into the car. Batting sandflies off of every inch of exposed skin, we raced to ford the river to get to the trailhead. Thankfully, they did not follow us for long. The Copeland River winds through a breathtaking part of the country and the trail is well-marked, but it is not flat. Not even close. It also contains several active rockslide areas, three–one person only–swing bridges, multiple small river crossings and, okay, like some of the most remote and beautiful wild mountains I’ve ever seen. After walking straight up one or two of those beautiful mountains on a trail that was the opposite of flat for seven hours, I realized the humor of the name “Welcome Flats.” The hut is situated on the only flat part of the trail and the lack of incline is very welcome indeed. It was nearly dark, so we set up camp and made dinner right away. Due to more sandflies, we ate inside our tent. I’m certain that the west coast of New Zealand would be heaven on earth if it wasn’t for those damn flies. We hopped into swimming gear and headed to the–very welcome–hot pools. On the way, a fortunate wrong turn led us to the camp of Liz from Long Island and Vincent from France. We enjoyed their delightful conversation in the dark and had the chance to see more glow worms on the underside of a super cool overhang. But we were only halfway.